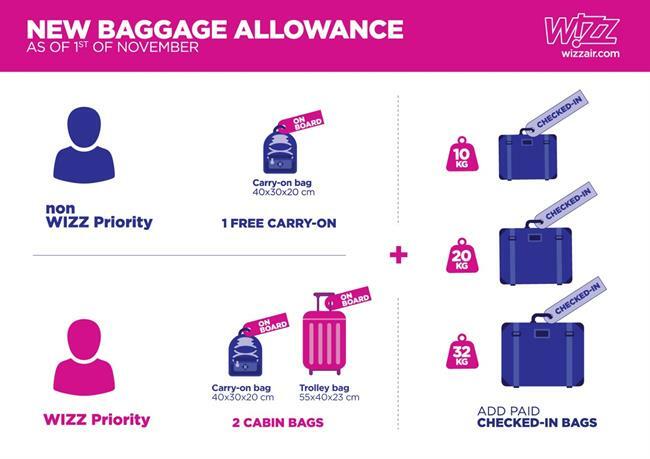 One of the fastest growing airlines in Europe, Wizz Air, is changing its baggage policy from 1st November, the airline confirmed this week. 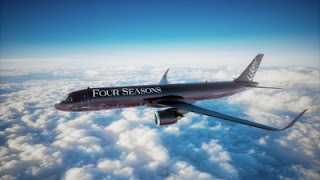 The new and transparent baggage policy is aimed at easing boarding for passengers and guarantees all passengers can bring one free carry-on bag. 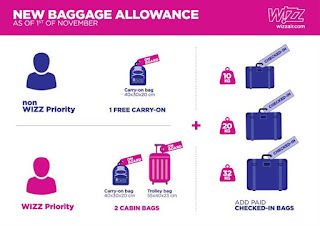 As of 1 November, every passenger is entitled to bring one free carry-on bag (40x30x20 cm) on board, while those passengers who purchase WIZZ Priority will be allowed to carry a trolley bag (55x40x23 cm) into the cabin as well. Based on customer feedback and the changing travel patterns, Wizz Air has introduced a 10kg checked-in bag to facilitate comfortable travel experience with prices starting from as low as €7. "We encourage our passengers to pack smart and purchase WIZZ Priority, which includes a free carry-on bag (40x30x20 cm), a trolley bag (55x40x23 cm) to be carried on board, Priority check in and Priority boarding from as low as €5."